Last year on Valentine’s Day, I was celebrating the fact that Caroline was still with us. 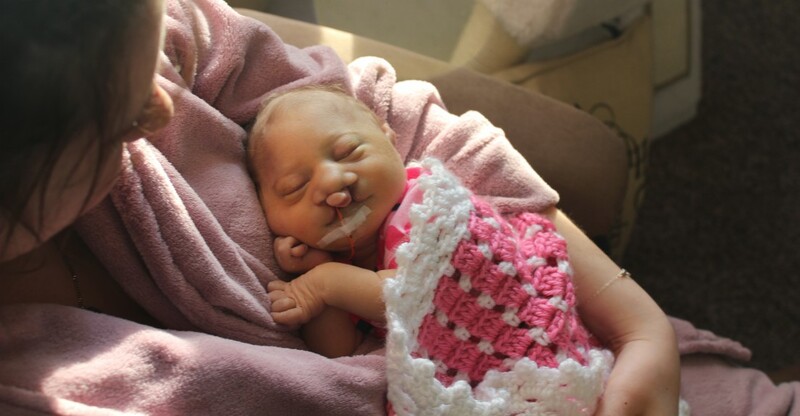 My husband and I knew that she could pass away at any time, but a little over a month before her due date she was still safe and sound in my womb. We cherished every day that we had with her. We loved every kick and every hiccup. We learned that she loved peanuts just like her dad. We took her to sporting events, knowing that it was likely our only chance to share those moments with her. We loved with a love that was too big for the fear of what was to come. We knew it would be hard to say goodbye, but we knew every second with our sweet daughter was worth the pain. We hoped and prayed that she would not suffer and that she would get the chance to meet her family. My husband went out of his way on Valentine’s Day. I came home from work to two bouquets of flowers in vases on the kitchen table. One had a dozen red roses and a card sat in front of it with my name. The other had a single pink rose and a card sat in front of it with her name. Caroline. I immediately began to cry. It meant so much that he had included Caroline in what would likely be our only Valentine’s Day together. We dried Caroline’s rose and saved it for her. It now sits by her urn, with the ribbon the rose was tied in and the words “I Love You” in a cursive script decoration that came with the flower. No words could be more true. We love you Caroline! Categories: Memory Monday | Tags: cherished, family, love, memories, rose, Valentine's Day | Permalink. We became separated, but Caroline is still carried in our hearts. Categories: Identity | Tags: couple, family, hearts, separated | Permalink.